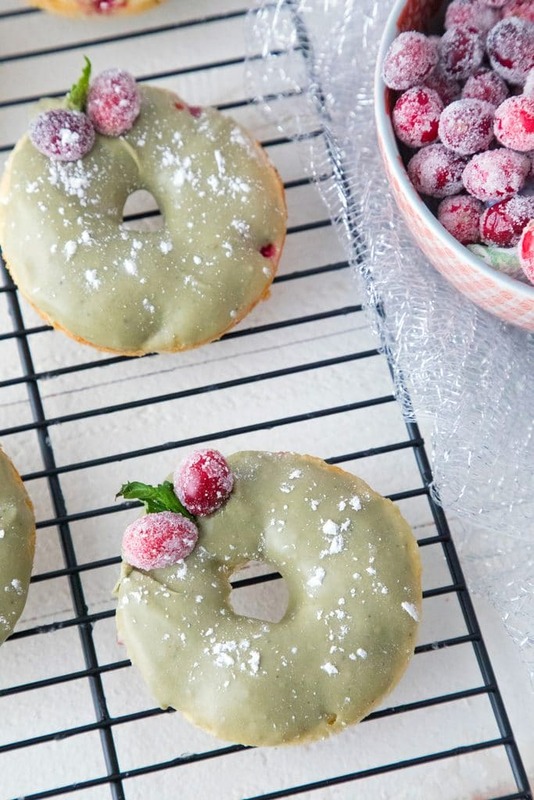 These Cranberry Matcha Donuts make the perfect addition to the holiday dessert or brunch table. But they’re actually healthier than the average donut and packed with antioxidants from the cranberries and matcha green tea powder! One of the seasonal foods I always miss the most after the holidays is cranberries. Partly because I love them so very much and partly because I love watching my dog when she gets her paws on one. Seriously, if I drop a cranberry on the floor, she will swat it around and pounce on it for hours on end. Then she’ll chew it a bit and, likely surprised by its tartness, spit it out before beginning to play again. Clearly, I’m easily entertained and I find myself dropping quite a few cranberries just to watch her. The thing is, cranberries actually stay in stores throughout the entire winter season… They just seem to disappear from the dinner table and dessert rotation once Christmas is over for some odd reason. I still like to add them to my smoothies year round, but why is nobody eating cranberry sauce or cranberry donuts beyond December? 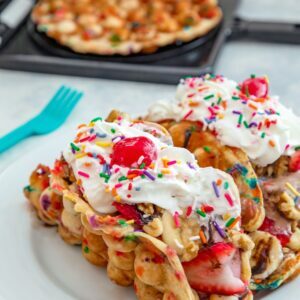 Are you guys all sick of Christmas recipes yet? I’m not at all! The holiday season always goes by too quickly and there are about a million more treats I want to make before it’s all over. But considering I only have 4 very busy days left before Christmas day, I’m starting to wind down on my holiday baking and beginning to think about what I want to focus on in the new year. Do you usually try to go healthy come January 1 or just continue on with your usual diet? I haven’t determined my full approach yet, but you know that even when I go healthy, I’m still adding in plenty treats. A diet without donuts is not a diet I ever want to be involved with. And these cranberry matcha donuts kinda check both boxes. 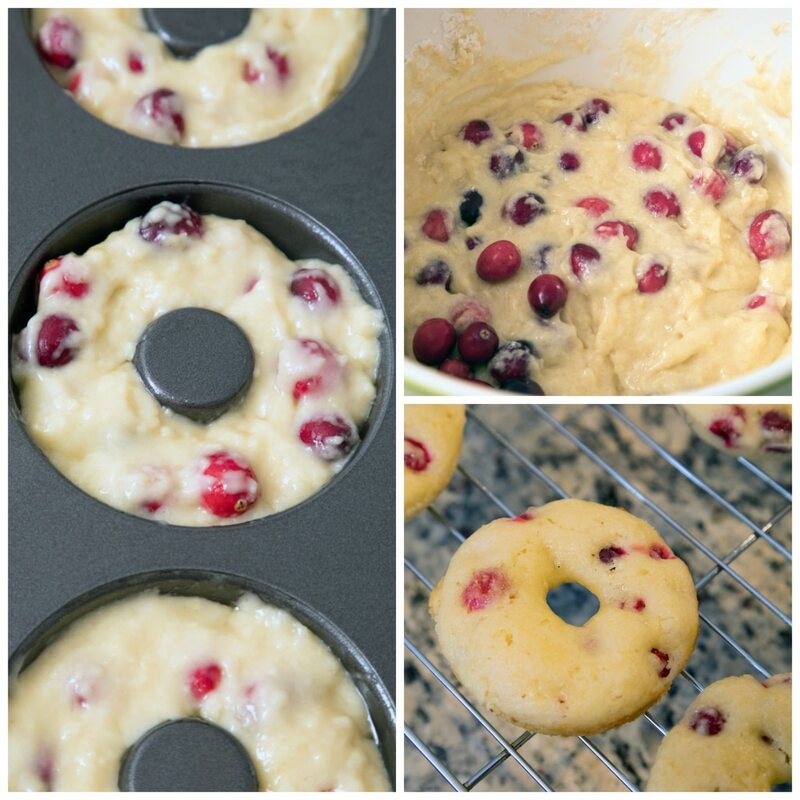 These donuts are holiday-themed in that they involve cranberries, but I urge you to make them whenever you can get your hands on fresh cranberries. 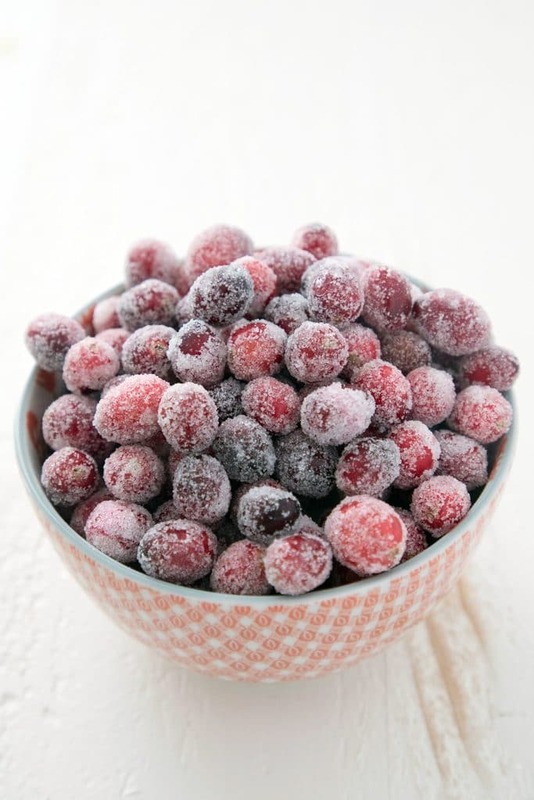 Or whenever you feel like pulling a bag of frozen cranberries out of your freezer (because you were so smart and remembered to freeze a few bags before they disappeared from stores!). And while yes, these are donuts, they are also baked. And filled with antioxidant-packed cranberries. And topped with antioxidant-packed matcha powder. Sooo these are basically as healthy as you can get with donuts and perfect for ringing in the new year in a healthy-ish way. You definitely don’t need to top the donuts with sugared cranberries, but if you have an excuse to make sugared cranberries, you may as well do it, right? I like to have them around all holiday season long; even just looking at sugared cranberries gets me in the holiday spirit. Plus, they look so pretty on top of the donuts! 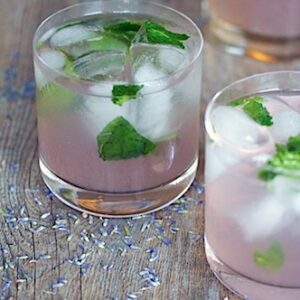 Especially if you add a little mint “leaf” garnish and sprinkle some confectioners’ sugar over the top. This is the kind of donut that you won’t feel too bad about eating for breakfast. They’re not overly sweet and obviously the cranberries add a super tart bite into the donut. The matcha icing involves sugar, of course, but it’s packed with matcha flavor. If you don’t like green tea, stay away! I think one of my resolutions for 2018 will be to incorporate more matcha into my life. I used to drink matcha water with lime every day (this is the one I buy), but have fallen off that wagon over the past year. Matcha has so many health benefits, including the fact that it has tons of antioxidants, helps detoxify and boost metabolism, and has been known to help calm the mind and relax the body. Yup, all of that sounds good to me! And if I can get it in donut form? Sign me up! 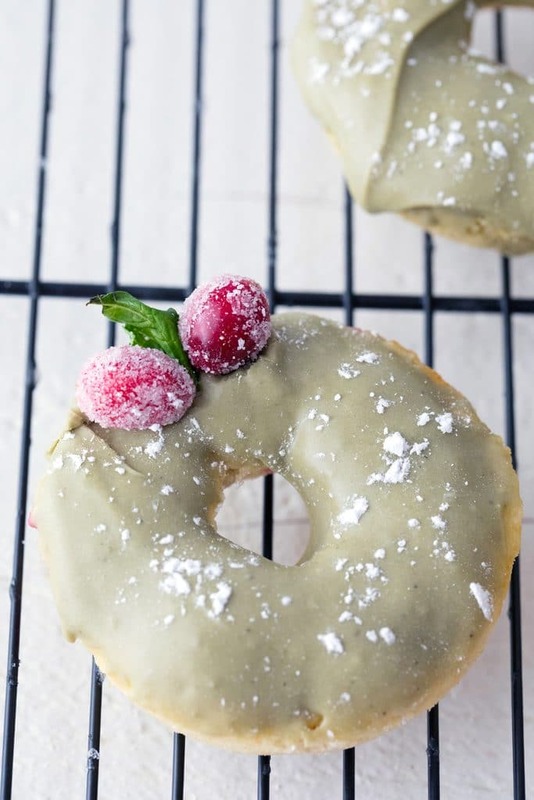 If you’re looking for something to serve with your Christmas morning breakfast or need a sweet treat to share with co-workers or at a holiday brunch, these cranberry donuts with matcha icing are perfect. They even look a little bit like mini Christmas wreathes! Now excuse me while I go browse the millions of amazing holiday desserts on Pinterest and cry to myself that I’ve run out of time for making any of them. Oh well, there’s always next year! And something tells me I’ll be having a marathon holiday baking session in July so I can be good and ready by the time holiday 2018 comes around. In the meantime, I’ll just be sitting here eating from that bowl of sugared cranberries and trying to resist tossing them to my dog. Are you a fan of cranberries and matcha/green tea powder? If you’re looking for more delicious donut recipes, check out this recipe for Coffee Glazed Chocolate Frosted Donuts or this recipe for Grapefruit Donuts. Enjoy!! 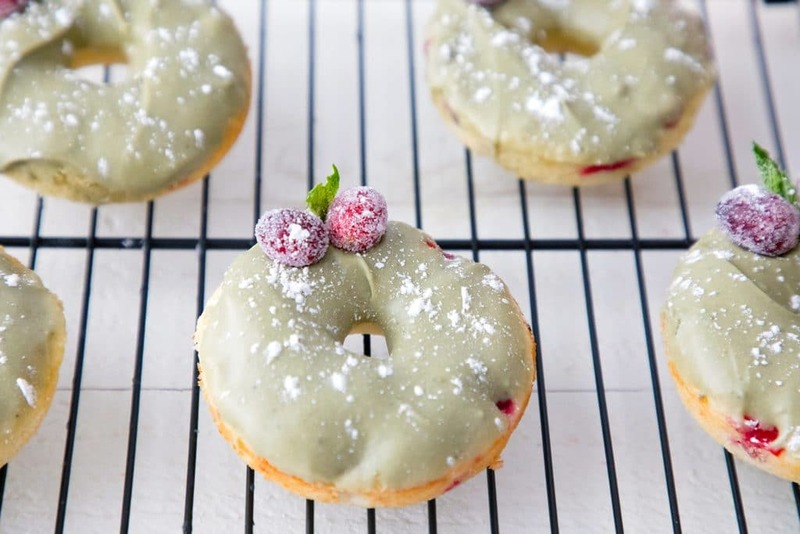 These Cranberry Matcha Donuts make the perfect addition to the holiday dessert or brunch table. But they're actually healthier than the average donut and packed with antioxidants from the cranberries and matcha green tea powder. Pre-heat oven to 350 degrees and spray donut pan with cooking spray. Whisk together flour, baking powder, salt, and granulated sugar in a large bowl. In a separate small bowl, whisk egg with milk, melted butter, and vanilla. 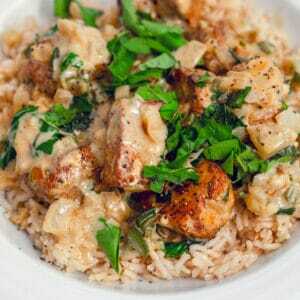 Gently stir wet ingredients into dry ingredients taking care not to over-mix. Fold in cranberries. Fill cavities of doughnut pan about 3/4 of the way with batter and bake for about 9-11 minutes, until doughnuts are cooked through and light and springy to the touch. Let cool in pan for a couple minutes before removing to wire rack to cool completely. 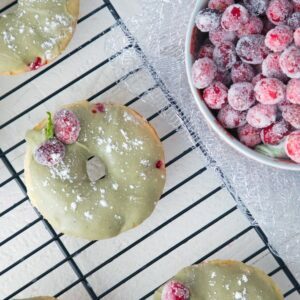 Once cool, dip doughnuts in matcha icing and top with sugared cranberries, mint and confectioners' sugar, if desired. In a medium bowl, whisk together powdered sugar and matcha powder. Add 4 tablespoons of heavy cream and whisk until smooth. If icing is too thick, whisk remaining tablespoon of cream in. 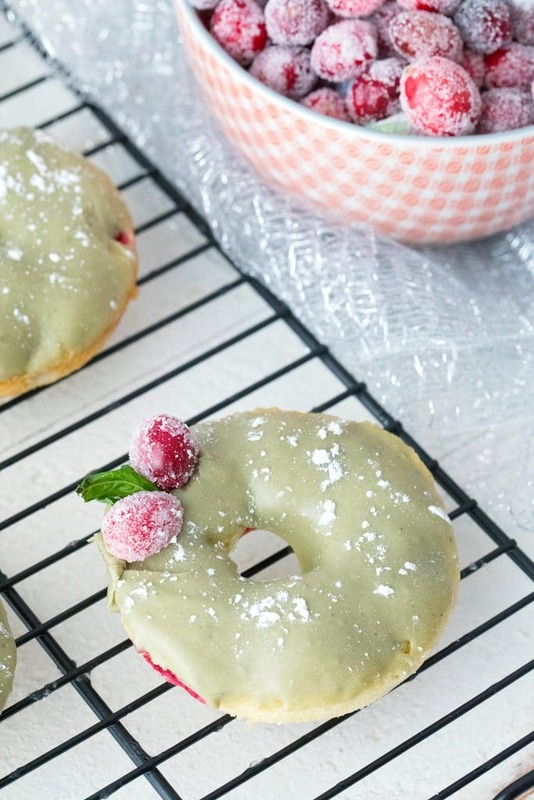 7 Responses to "Cranberry Matcha Donuts"
Those look gorgeous and very festive. Just perfect for this time of year. 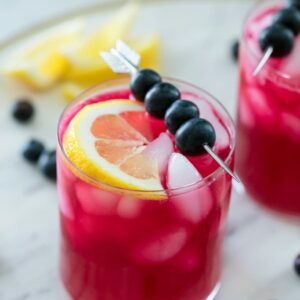 I am loving any way I can use cranberries at the moment and matcha is something I want to use more, so this sounds delicious. YUM! These donuts look amazing and just perfect for Christmas! These are so pretty!! Perfect for Christmas morning over coffee 🙂 Merry Christmas!! WOW this donuts look so pretty and creative. I love matcha so definitely I would try this with coffee yummy! Love how festive these are for the holidays. And they look delish!